I am here today with members of my Government to say to all of you that the State deeply shares in your sorrow. We remember not only one moment of tragedy but 19 lives of great purpose and promise. 2. This is the second mass burial we have the misfortune to organize in the last 5 months. On January 11, 2018, we had the mass funeral and burial of 73 of our patriots who were slaughtered in the 2018 New Year attacks by armed herdsmen in Guma and Logo Local Government Areas of Benue State. We never expected another such day. But we were wrong. On 15th March, 2018, we held another mass funeral for 26 victims of herdsmen attack in Omusu, Okpokwu local government area of the state. From January1 to date, Benue is being attacked by herdsmen nearly every day not only in Guma and Logo but also in Ukum, Agatu, Okpokwu, Kwande, Gwer west, Gwer East and even Makurdi LGAs. At least 18 of our 23 LGAs have been attacked. 3. In the early hours of April 25, Rev. Father Joseph Gor, Rev. Father Felix Tyolaha and 17 other worshipers were again brutally killed by armed herdsmen at Quasi Parish Ukpor, Mbalom in Gwer East Local Government Area. They were in early morning prayers in the Church when they were gunned down. 4. The Reverend Fathers are not farmers. They were not in the farm. The church where they were holding the mass has no grass. 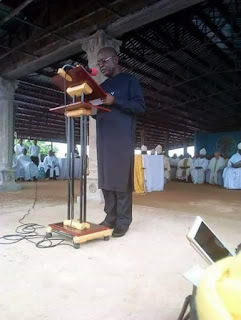 It is therefore curious why Reverend Fathers who do not have a farm and parishioners who were worshiping God would be killed by herdsmen in the Church. By so doing, the armed herdsmen have moved the narrative of the current crisis from search of grass to other obvious motives. 5. On this very difficult day, in this difficult time for Benue and for Nigeria, it is important to ask our country: what kind of nation are we? What direction do we want to move to? Are we going forward or backward. Are we also in the 21st century? People are killing us. We know our killers, but they are neither questioned nor arrested. In two separate Press Conferences which were widely reported in the media the Miyetti Allah Kautal Hore and Miyetti Allah Cattle Herders Association called on Fulani herders in all of West Africa and beyond to reject the state law on Ranching and to come into Benue to help them reclaim their land. They swore that, “more blood will flow in Benue” if the Ranching Law is not rescinded. We are continually being killed not because we do not know our killers. It is because we know our killers that we are being killed. Our concern is not with herdsmen militia, Libyans, Boko Haram, ISIS or any mercenary. Our concern is those who hire them, who bring them and show them the killing fields. The arrest and prosecution of Miyette Allah Kautal Hore and Miyetti Allah Cattle Herders Association will be the beginning of elementary practice of justice for the 492 people so far killed in Benue by herdsmen. 6. Our Ranching Law which prohibits open grazing is an instrument of development. It launches Nigeria into the 21st century where open grazing is extinct in many other countries of the world. According to the United States Department of Agriculture, USDA, India has 303million cattle, Brazil has 226m, China has 100m, USA has 93m, European Union 89m, Argentina 53m and Australia 27m. All these countries ranch their animals. Nigeria has only a little less than 20 million cattle which should be ranched. Ranching provides an avenue for both crop farmers and those involved in animal husbandry to increase production using modern technology. 7. Implementing Ranching policy in Nigeria has great positive implications on our food security. Both the National Economic Council (NEC) and Forum of 19 Northern Governors have already endorsed Ranching as the only sustainable solution to the current invasion by herdsmen. The idea of Ranching cattle in Nigeria cannot and should not be ignored. Those involved in the profitable cattle rearing business need to go beyond endorsement to establishment of ranches. 8. Ladies and Gentlemen, we cannot know how long we may have these avoidable trials, and pains. But we know God’s plan for us. Good plan with a future where herders and farmers will live in peace, where there will be no cattle rustling. A future where there will be freedom of worship and no ethnic or racial discrimination. 9. God uses good people to do great things. The blood of good people like Rev. Fathers Joseph Gor and Felix Tyolaha and 17 others will not be in vain. Their death and burial may mark the beginning of the end of political instability and the killings across the nation. With their death, the whole nation, indeed the international community is now aware of this calamity. The Representative of His Grace, The Pope who is the Head of Catholic Church worldwide is here. The Catholic Church is widely known for championing justice, peace and equity around the world and will not turn its back on any incidence of genocide and ethnic cleansing. 10. Benue State and especially Mbalom community was blessed to have such great Catholic Priests serving with us. They deeply loved the community and the community also loved them. 11. Your Excellency the Vice President, My Lords, distinguished Ladies and gentlemen, please join me to commend the Catholic Church in Benue and indeed in Nigeria for their giant strides in social development. We commend them for providing good and quality education, outstanding health facilities and charity work across the state. Above all, the Catholic Church remains a loud voice for the voiceless, for the powerless, the downtrodden and the undisputed champion of crusaders for peace and Social Justice. - Though many of our homes, schools, and health centres are destroyed. - Though we have 2,442 of our pregnant women and 2,766 nursing mothers in IDP Camps. All these because of armed herdsmen attacks and invasion. We are determined to keep on crying until justice comes. The night is long, very long but we are now at dawn, and morning will soon be here. 13. The Rev. Fathers dedicated their lives to love, justice and spiritual service to fellow human beings. They died actively doing just that. The 17 worshipers died along with their beloved Priests. It is pain to us but we know, that they are now in a better place where there will be no ethnic cleansing. They are all in a place of comfort where armed herders will never kill them. 14. Our people are being tested again, but as we mourn, our detractors should know this: we have unbroken spirit and have remained committed to our faith in Christ and in our mission to evolve a peaceful Agricultural community through the Ranching Law.We appeal to our people not to take laws into their hands, for vengeance belongs to God and two wrongs do not make a right. 15. I want to commend the President of Nigeria and the Federal government for the recent deployment of troops and security agents to Benue. We hope that they will drive away the killer-herdsmen to allow our people leave IDP camps to their homes. Permit me to one again welcome our father and leader, the Vice president of the Federal Republic of Nigeria, Prof Yemi Osinbajo, SAN. We have mantrouples but our father is not tired of us. He has not abandoned us. Only last week he was here to visit with us and brought message of comfort and hope for men, women and children and he personally visited them in IDP camps. We deeply appreciate you sir for beefing up security here, and indeed for the assurances you gave the people. Above all we appreciate you for identifying with us at this very difficult time. We commend security agencies for their sacrifice to give us peace. May God console the families of those who have made the supreme sacrifice. - and God never fails.